Back in March while I was on holiday – the internet suddenly came alive with the news that Kate Bush was going on tour. Did I really want to see Kate Bush? Well yes… But did I think that there were going to be an awful lot of people going who had to “Do it”? Yes. I took the easy decision and stayed away. Later I heard that 22 nights had sold out in some extraordinarily fast time. Lots of rueful people were showing up on my Twitter feed ticketless. I felt at peace with myself. I can go without. Kate Bush fever was ratcheting up, not least because the regular Friday night music slot on BBC Four was getting the full treatment with a documentary stuffed full of famous faces, and then as many live performances at the BBC as they were able to find and clear. I sat down on a wet Sunday and was thrilled. It was an excellent documentary, almost in spite of quite so many famous faces. Notably one was absent of course. If you haven’t seen it, you have four days to do so at time of writing, and I recommend it. Still – the concerts were all sold out months ago. I woke up on Tuesday morning and the radio was full of Kate Bush. Meanwhile her songs are earworms. I can’t stop humming them. In some ways, judging from those who showed up at the first night, it was all the more remarkable that I got in given the plethora of celebrities. It's amazing how many famous people must have really good internet connectivity to successfully get those #KateBush tickets! That said, I only saw Frank Skinner, and I used to work at the same radio station as him, so that doesn’t really count. The rest I found out about when I read The Guardian’s Live Blog of the show… (Hang on! They did a live blog!!!) Still as someone suggested to me on Twitter, perhaps either Kate Moss or George Clooney couldn’t make it, and that’s why I managed to nab a seat. As I collected my ticket, I noticed that not only was the show starting at 7.45pm promptly, it wasn’t due to finish until 11.00pm. Even with an interval, that’s well into Bruce Springsteen territory. We’d been asked not to take photos, and you know what, at least in the circle, barely anyone did. A few couldn’t help themselves at the end, and a few Apollo staff members sauntered around occasionally to check. But I saw hardly anyone with their phone or cameras out. Remarkable. In the bar beforehand, I ran into a friend, and we exchanged thoughts on what we’d see. He was worried that there wouldn’t be any hits. I said that I thought the whole thing would be more of a show than a gig and it’d be very choreographed. But we’d definitely get the hits. So when it started in regular band mode with Bush at the front, a band and backing singers, and a few of her hits, I thought I’d misjudged it a little. The clue is really in the photo at the top of the page. 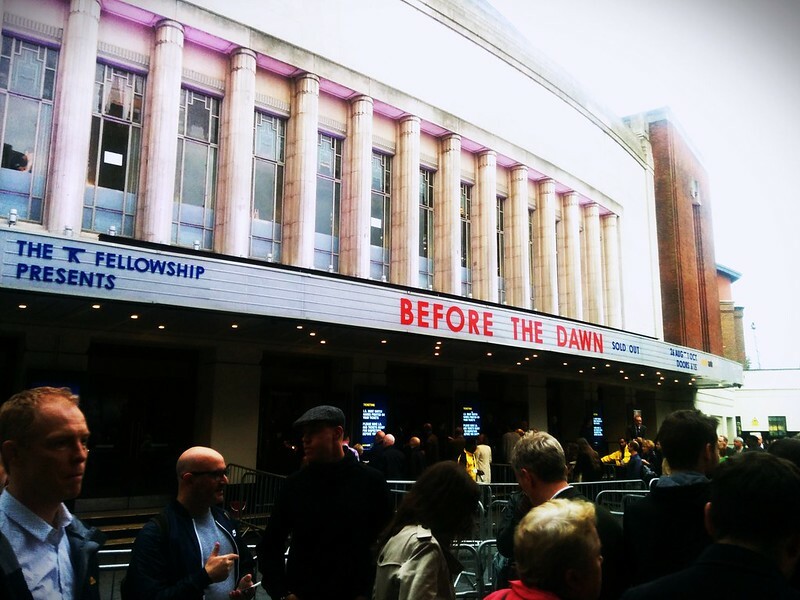 It doesn’t actually say “Kate Bush” on the sign – it says Before the Dawn. This was definitely going to be a show. And now we were getting The Ninth Wave, the 2nd side of The Hounds of Love album. 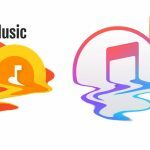 Most people know the big songs from the A-side – the title track, Cloudbusting, Running Up That Hill and The Big Sky. But the rest of the album is a concept piece – not dissimilar to a rock opera (I forget which contributor to the BBC Four documentary made this point at the weekend). And in this show, this was fully realised in a multi-media production. There were video clips, footage of Bush floating – seemingly in and out of consciousness – in a big tank wearing a life-jacket. Then we moved onto the rest of the piece with dancers, and big set pieces. Most spectacular of all, there was a lighting rig that became a rescue helicopter with a searchlight. It’s really effective. After an interval, we get a second “show.” This time, it was based around the second disc from 2005’s Aerial. 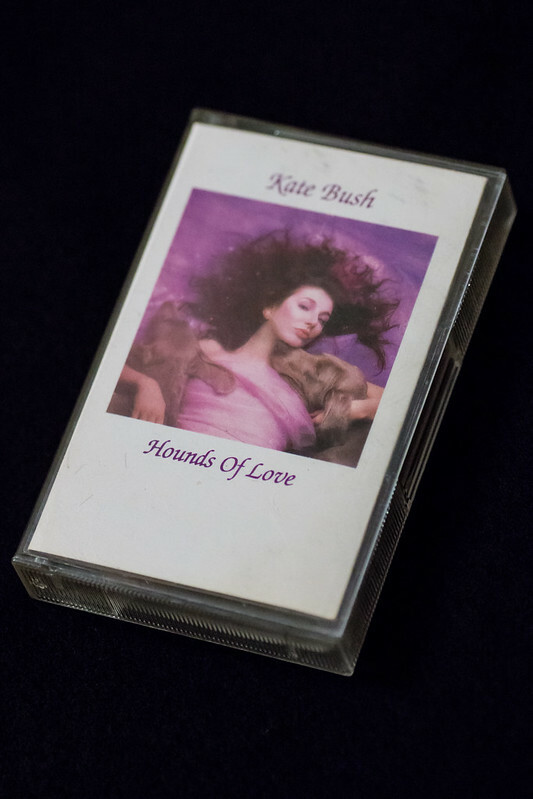 I must admit that although I own the album, I don’t know this music as well (Hounds of Love was one of my favourite albums of all time). But the scale is as big or even bigger. There were intricate projections and as in the album lots of birds. This really is a theatrical piece, and it must have lasted a full hour. She finished with a couple more songs as an encore, but not really her older work. (The full setlist is here) We finished with Cloudbusting and the audience stayed around hoping for more, but not getting any. The Apollo had to work hard to make us leave! Nobody should have been surprised. If there’s nothing else that Kate Bush’s career has told us, it’s that she does what she wants. Would I have liked to have seen her really early songs? Yes. But I suspect that from her perspective, she did that show in this very building in 1979 (when I was 9), and she feels no need to repeat herself. My friend texted me after the show. He reckoned he’d counted three hits. I didn’t care. (There’s Kate Bush at the BBC for anything that you were missing). But did we get our socks knocked off? Certainly. Is her voice still as powerful as ever? Definitely (although I hope 22 shows isn’t too many in quick succession). Did I enjoy myself? Absolutely! I’ve read quite a few reviews of the first gig and they’re all similar in one respect. Everyone says they were blown away and had the time of their life. Then comes the inevitable ‘but’. And it revolves around choice of set list. “Amazing gig, wish she’d have sang…”. Whenever you go to a gig and the band have had a long successful career there are going to be disappointments in the set list. True of me in later years going to see The Cure and Depeche Mode. 30+ year career, body of work spanning a dozen or more albums, it’s inevitable that they won’t play “my perfect set list”. I’m sure Kate was only too aware that she couldn’t possibly please everyone. So she just decided to do her own thing. And you know, I respect her for that. [Belatedly] I think that’s pretty much it. To some extent, it’s just the nature of being a fifty-something rather than nineteen. Your voice is different and you’d need to change the keys. I think it’s also the nature of the kind of person she is and the show she was presenting. Her vision was to theatrically stage two of her song cycles, and that’s precisely what she did.